One of the best things that happened to me in 2015 is my dream of getting a full – time job that is location and time flexible. I feel like I was slowly dying while I am at my regular job that I couldn’t cope with it anymore due to more trips and blogging events that come my way. I’ve been praying so hard that I find the answer to jump back again to the freelance life – this time I’ll make sure it is going to be worth it and I have learned my lessons enough. Month of August, while I stalk my favourite travel bloggers of their whereabouts, read their daily dose of articles and join them in their travel Facebook groups, I learned about this brand that gives sponsored trip for travel bloggers to Cambodia. I was really hesitant to try my luck since I am no big time travel blogger slash writer and my followers on social media are not that big by numbers. However there are two things that I know of myself: first – I will do everything for travel and that after joining a lot of social media meetups mixed with startup events, I somehow learned to craft my own pitch that I always get a Yes to most of the brands I ask for partnership, collaboration, ex – deal et cetera. 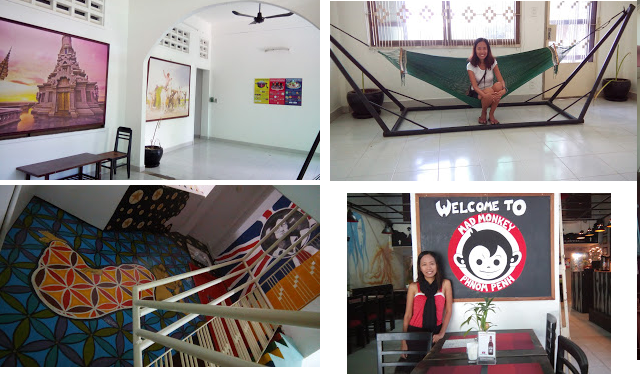 The company looking to work with bloggers is Mad Monkey Hostel, one of the most famous backpacker and socially responsible hostels in Cambodia. They got four branches all over – Phnom Penh (capital), Siem Reap (Angkor wat), Koh Rong Samloem (an island) and Kampot (riverside). They also have a budget hotel in Siem Reap called Naga hotel. The initial plan is that the only one covered is the accommodation and food to be consumed in the restaurant of hostel for a specific amount. I quickly sent my pitch via the form from their official website, have not heard anything after a few days so I made extra efforts to contact the Facebook fan page to see if someone will get back to me in real time. I was personally replied by no other than the founder of Mad Monkey Hostel, a very intelligent British guy when it comes to social media, online marketing, seo and all that. Had I not tried and let my fears stop me from applying just because I am a small fish, there were two things that happened which I never ever expect: they offered me to write ten articles to cover up the flight expense I need to book so it became an all expense paid trip and the most important is I was offered to become the Social Media Manager, a remote work that only needs a laptop and Internet connection to fulfill the tasks. I swear I never knew about this job that the owner is looking to hire soon until he said so. While at my regular job, I painstakingly wrote the ten travel guides to be posted on their website and religiously watched out for the cheapest promo fair from Air Asia. The next thing I knew is that I flew to Cambodia with a stopover in Malaysia on another solo backpacking trip for 4 days. There I got blown away - just by staying in Mad Monkey Hostel itself, the travelers I have met are already from all over the world. Most of them are from US, Australia and across Europe. I was actually asked prior if I want a private room, I said I prefer to stay in a dorm bed. In the dorm room where I stay the 5 girls comes from a different country in the globe, as a matter of fact I am the only Filipina and the only Asian in that room. All of them are travelling at least a month or so. Their next destination is in another country while me I am the ONLY ONE heading home. I quit my regular job a month after I went back to Manila to finally follow where my heart is – in the online world of travel and digital marketing powered by social media. I am still learning the ropes in the social media world. I do have weakness that I found out that though, I and realized that serious travel writing isn’t my cup of tea but I am so far happy with this decision of working online. I am typing this out here in my hometown in Irosin with my family. Since I have no physical office to report for work, I am not rushing to go back to Manila. This actually is the longest holiday vacation I have ever made all because my job is now remote. I wouldn’t be able to have this freedom I was longing for so long had I not tried. I am not seeing myself going back to a normal office where I have to be imprisoned by place and tied to a duration of hours. I have only been doing this for three months but I have been learning a lot from the owner who is a geek in his own right in the online world. I am so amazed how he built this backpacker hostel from the scratch and his wisdom about marketing strategies in the whole world using social media and seo. I am learning every day how pages are ranked, how to be more visible and the "bestest" part is I collate the world's travel bloggers. I may not have double pays for working holidays and night differential but the freedom of being in control of myself again is priceless. This 2016, I am spreading the word to anyone who are too afraid to take risks – it’s true: you’ll never really know unless you try. To my fellow travel bloggers and writers, I’d like to tell you that the Mad Monkey Creative Hub is still open and looking to work with you. Please click here to for more details. Thanks :) yeah please send your pitch. Hi Rona! This is wonderful and I'm excited. I already joined however, I could seem to know whether it got through coz after I hit the send pitch button, it gave me a page could not be displayed notice. Praying to get picked. hmmm can you please try to send it again?